Russia’s active steps in boosting its air and missile defense capabilities are aimed against the potential threat of Prompt Global Strike which US “under certain conditions” might decide to carry out, says Russia’s Aerospace Defense Forces’ deputy chief. The potential threat of Prompt Global Strike by the United States against the Russian Federation is one of the top challenges for the Aerospace Defense Forces, Major General Kirill Makarov told the Russian News Service radio. In this regard an effective air and missile defense system remains one of Russia’s top priorities, since PGS initiative aims to deliver a precision-guided conventional weapon airstrike within less than one hour after Washington deems the target to be a national security threat. Washington’s PGS has an overall structure similar to that of a nuclear triad. It first of all aims to conduct swift strikes from land and sea using already existing inter-continental and submarine-based ballistic and cruise missiles. Air-launched hypersonic missile currently in development is a second option the Pentagon is working on. In addition there were hypothetical plans of kinetic bombardments from an orbiting space platform. Russia estimates that by 2020, the US will have up to 8,000 cruise missiles, some 6,000 of which will be capable of carrying nuclear warheads. With “some degree of certainty” one could asses that “under certain conditions” these military assets could be deployed against targets in the territory of the Russian Federation, Makarov said. Russia’s new military doctrine, adopted last year, stresses that the country’s army remains a defensive tool, but lists the PGS concept as one of the main security threats along with NATO's military buildup along Russian borders. The Russian military however may still be eventually forced to to match the PGS with a rival initiative. “Russia is capable of and will have to develop a similar system,” Deputy Defense Minister Yuri Borisov said last year. To counter the threat, Russia is developing a new generation mobile surface-to-air missile system – the S-500 – designed among other things to intercept supersonic targets. While the missile for the system is “still under development,” Makarov says once completed, it would be capable of intercepting any perspective ballistic and aerodynamic targets. 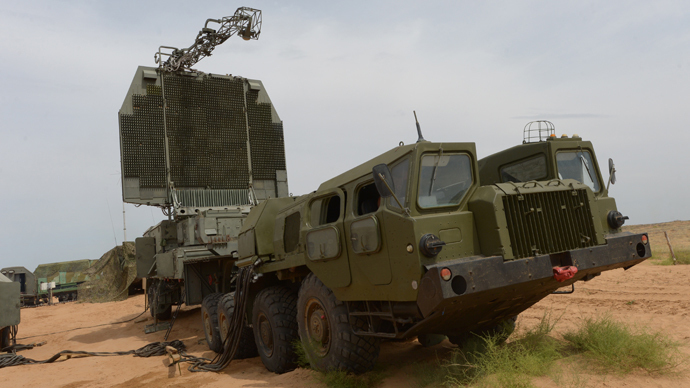 In the meantime, Russia has carried out successful testing of a new longer-range guided missile for the current generation S-400 surface-to-air air defense system. “Tests are currently in full swing. Three days ago we successfully carried out testing of a surface-to-air missile which successfully hit its target,” Makarov said. While the Russian capital has almost 100 percent protection from all kinds of air attacks, according to the general, that Aerospace Defense Forces are working hard to secure Russia’s distant frontiers. In the Arctic region, Russia has already deployed air defense missile and artillery systems. The Defense Ministry also plans to deploy MiG-31 interceptor aircraft to protect Russian vessels sailing along the Northern Sea Route. “We have already placed Pantsir systems [in the Arctic]. Deployment of MiG-31 on Russia’s Arctic airfields is planned,” Makarov said. Meanwhile a new fully automatic radar station is undergoing final tests. According to the spokesman, the network of these stations working without any personnel will stretch into the Arctic, and will require maintenance only once a month.